We have one simple mission: to help you find that special someone. It's been the idea that's inspired us since 2003, when we first launched our new technology to create a better way for people to find each other. Instead of playing the game of chance that meet the person of your dreams at a local bar, or in the office elevator, we give you the power to take your romantic destiny into your own hands. Since 2003 we've learned a lot about what people want and how to produce the tools they need to find that special someone. With our close attention to detail we can truly say we've come a very long way. 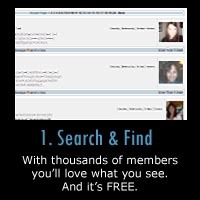 Our member profiles give you a unique essence of who are members are so you can get to know them before you get to meet them. Our community is full of real men and women who are respectfully looking for a serious relationship. So get started by searching and creating your free profile100% FREE Today!! More people. More choices. More ways to connect.